We address the dynamic glaciology of glacier-like forms (GLFs) on Mars, over 1300 of which are located in the planet's midlatitude regions. We present case studies to gain insight into (i) the former extent of GLFs, (ii) GLF motion and surface crevassing, (iii) GLF debris transfer (suggesting a best-estimate surface velocity of 7.5 mm/a over the past 2 Ma), and (iv) putative GLF surface hydrology. Finally, we present several possible research directions for the future study of Martian GLFs. 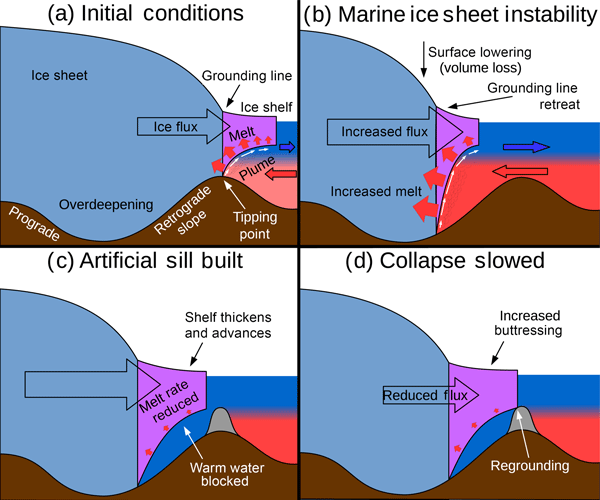 In this paper, we explore the possibility of using locally targeted geoengineering to slow the rate of an ice sheet collapse. We find that an intervention as big as existing large civil engineering projects could have a 30 % probability of stopping an ice sheet collapse, while larger interventions have better odds of success. With more research to improve upon the simple designs we considered, it may be possible to perfect a design that was both achievable and had good odds of success. Within the last year, a large rift in the southern part of the Larsen C Ice Shelf, Antarctic Peninsula, propagated towards the inner part of the ice shelf. In this study we present the development of the rift as derived from remote sensing data and assess the impact of possible calving scenarios on the future stability of the Larsen C Ice Shelf, using a numerical model. We find that the calving front is likely to become unstable after the anticipated calving events. A spurious jump in the satellite record: has Antarctic sea ice expansion been overestimated? We describe and apply a newly developed glacial mapping algorithm which uses spectral, topographic, velocity, and spatial data to quickly and accurately map glacial extents over a wide area. This method maps both clean glacier ice and debris-covered glacier tongues across diverse topographic, land cover, and spectral settings using primarily open-source tools. 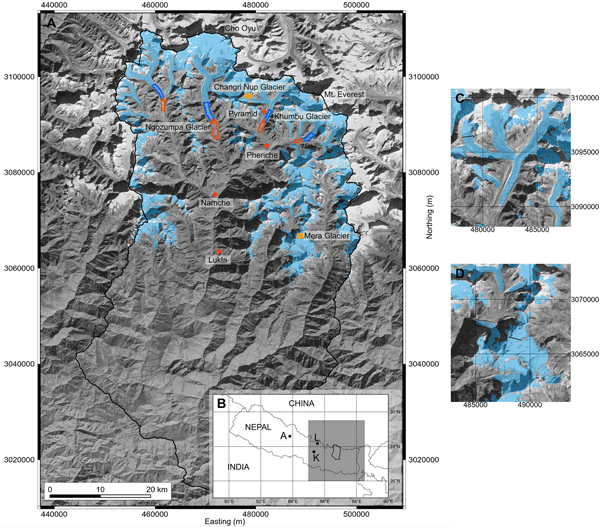 A glacier mass balance and redistribution model that integrates field observations and downscaled climate fields is developed to examine glacier sensitivity to future climate in the Everest region of Nepal. 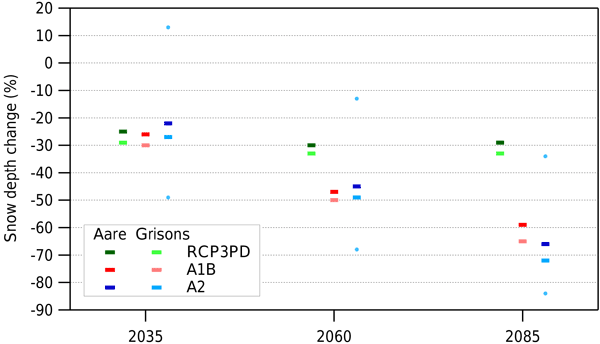 The modelled sensitivity of glaciers to future climate change is high, and glacier mass loss is sustained through the 21st century for both middle- and high-emission scenarios. Projected temperature increases will expose large glacier areas to melt and reduce snow accumulations. We detected up to 70 ppb of black carbon (BC) in surface snow in the upper Khumbu Valley, Nepal. With an upgraded snowpack model, including radiative transfer inside the snow, we studied the impact of BC on snow albedo, melting and radiative forcing for the sensitive high altitude regions of the Himalayas. We found that due to BC, the melting of the snow can be shifted by several days up to several weeks depending on meteorological conditions. The impact of BC is larger in dirty snow. An unmanned aerial vehicle (UAV) equipped with a commercial digital camera enabled us to obtain high-resolution digital images of the calving front of Store glacier, Greenland. The three sorties flown enabled key glaciological parameters to be quantified in sufficient detail to reveal that the terminus of Store glacier is a complex system with large variations in crevasse patterns surface velocities, calving processes, surface elevations and front positions at a daily and seasonal timescale. We simulate the future snow cover in the Alps with the help of a snow model, which is fed by projected temperature and precipitation changes from a large set of climate models. The results demonstrate that snow below 1000 m is probably a rare guest at the end of the century. Moreover, even above 3000 m the simulations show a drastic decrease in snow depth. However, the results reveal that the projected snow cover reduction can be mitigated by 50 % if we manage to keep global warming below 2°. The sea ice thickness of the Arctic Basin is estimated from sources that include upward-looking sonars, electromagnetic sensors, and lidar or radar altimeters. Good agreement is found between five of the systems while larger systematic differences are found for others. The trend in annual mean ice thickness, 2000--2013, is –0.58–/+0.07m decade–1; for the central Arctic Basin alone the annual mean ice thickness has decreased from 3.45m in 1975 to 1.11m in 2013, a 68% reduction. Coastal erosion rates at Muostakh Island (eastern Siberian Arctic) have doubled, based on remotely sensed observations of land loss, and therefore the island will disappear prematurely. Based on analyses of seasonal variability of permafrost thaw, thermo-erosion increases by 1.2m per year when summer temperatures rise by 1°C. Due to rapid permafrost thaw, the land surface is subsiding up to 11cm per year, based on comparison of elevation changes and active layer thaw depth. We map present-day Antarctic surface velocities from Landsat imagery and compare to earlier estimates from radar. Flow accelerations across the grounding lines of West Antarctica's Amundsen Sea Embayment, Getz Ice Shelf and the western Antarctic Peninsula, account for 89 % of the observed increase in ice discharge. In contrast, glaciers draining the East Antarctic have been remarkably stable. Our work suggests that patterns of mass loss are part of a longer-term phase of enhanced flow.